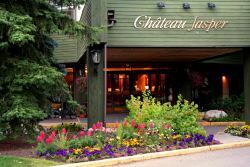 The Chateau Jasper is an exceptional hotel with an excellent variety of accommodations and facilities. This conveniently located hotel in Jasper offers 119 fully air-conditioned luxury guest rooms and suites, pleasantly furnished with mountain decor in mind. Other features of this intimate hotel include an indoor swimming pool and whirlpool, a variety of meeting rooms, a lounge, as well as an award-winning, fine dining room. All Chateau Jasper guest rooms are fully air-conditioned and feature solid Canadian Maple furnishings and offer a bath and shower; a fine assortment of amenities including a hair dryer, bath robes, remote control, colour cable television with pay per view movies and Nintendo, in-room safe, and complementary coffee/tea. The Chateau Jasper is also the proud recipient of the Travel Alberta Good Housekeeping Award.